Two instruments to assess critical thinking learning environments that were developed and validated by faculty and staff at the University of Louisville. What are the Critical Thinking Inventories? This inventory asks students to report their perception of critical thinking skill building as facilitated by their instructor in a specific course learning environment. This instrument asks instructors to report on their facilitation of critical thinking skills within a specific course learning environment. The LCTI and TCTI are validated instruments that provide you with a quick, anonymous way to self-assess the critical thinking characteristics of your course from your own perspective and the perspective of your students. The results from these inventories may be used by instructors or by academic programs to help inform how instructors can facilitate critical thinking skill building within a specific course and/or by the university to assess and improve the integration of critical thinking within the undergraduate educational environment. Why were the CTIs developed? Van Zyl, M.A., Bays, C.L., & Gilchrist, C. (2013). 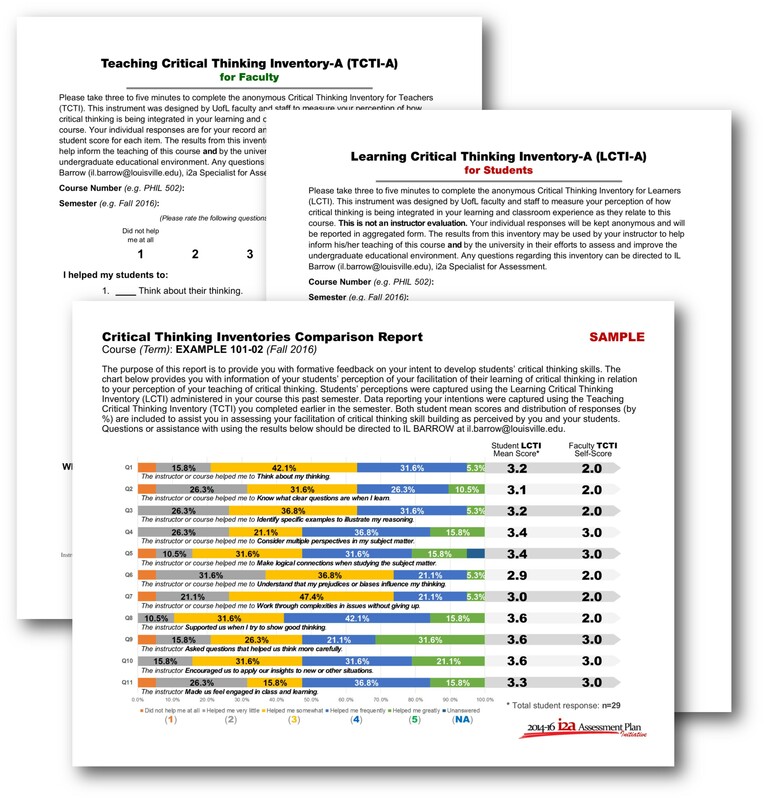 Assessing teaching critical thinking with validated critical thinking inventories: The learning critical thinking inventory (LCTI) and the teaching critical thinking inventory (TCTI). Inquiry: Critical Thinking Across The Discipline, 28(3), 40-50. Download a copy of the journal article here [PDF]. How can I easily administer the LCTI to my students? Both the LCTI and TCTI contain 11 Likert items and should each take no more than 5 minutes to complete. The LCTI student instrument can be deployed and is viewable within the “Assignments” section under “Assessments” -> “Survey” in your Blackboard course shell. The instructor can control visibility and access of the instrument via standard Blackboard control functions. All student responses from the LCTI remain anonymous. Please refer to the document titled “LCTI Survey Deployment” [PDF] for detailed instructions on making the assessment visible to students. Download a copy of the Learning Critical Thinking Inventory here [PDF]. How do I complete the TCTI that is designed specifically for instructors? The TCTI instructor instrument is for your use only and is not located in your Blackboard course shell. Instructors can access and download an Adobe copy of the TCTI below. You can fill out the inventory at the beginning or end of the semester. Ideally, you will compare your self-assessment scores with the aggregated student scores at the end of the semester. You can then affirm the alignment of or identify possible gaps between your own perceptions and your students’ perceptions in order to make adjustments to the learning environment. Download a copy of the Teaching Critical Thinking Inventory here [PDF]. How do I review my results from students? You will have complete access to student responses on the LCTI within your Blackboard Learn course shell. The course grade center will record which student completed the LCTI, but will only report out individual responses in aggregated form. Detailed instructions for accessing the student data is located here [PDF]. You will be given the opportunity to submit their data to the Quality Enhancement Plan team to have those data converted to a CTI feedback report. IL Barrow, QEP Specialist for Assessment, at the Delphi Center for Teaching and Learning is available upon request to assist you in organizing and using your data for continuous improvement. Download an example feedback report here [PDF]. Where can I find additional information on the use of the CTIs? For additional questions, please download an exhaustive Frequently Asked Questions (FAQ) document for instructors here [PDF]. Who can I contact for additional information on the CTIs?